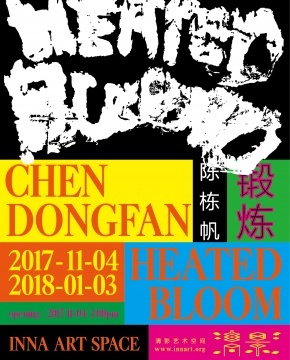 The exhibition "Heated Bloom" presents work produced by artist Chen Dongfan over the last two years (2015-2017) in New York. The exhibition space is divided into five segments: "You are not alone", "Daily News", "Viewing Platform", "Heated Bloom" and "Invalid". As being Chen Dongfan's third exhibition at the Inna Art Space, the event also serves as the international release and book signing for limited editions of the artist's book "Daily News". Chen Dongfan, currently living and working in New York.